Nokia has launched its new 8 megapixel N-series mobile phone, N86,in India. Nokia N86 is available in Indigo Black . Nokia N86 is priced at Rs 27,359 in India. 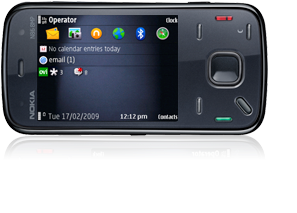 Nokia claims, the Nokia N86 8MP is a powerful all-in-one mobile featuring a great 8 megapixel camera with Carl Zeiss optics. You'll have a convenient way to capture quality images and share them on-line with friends and family.